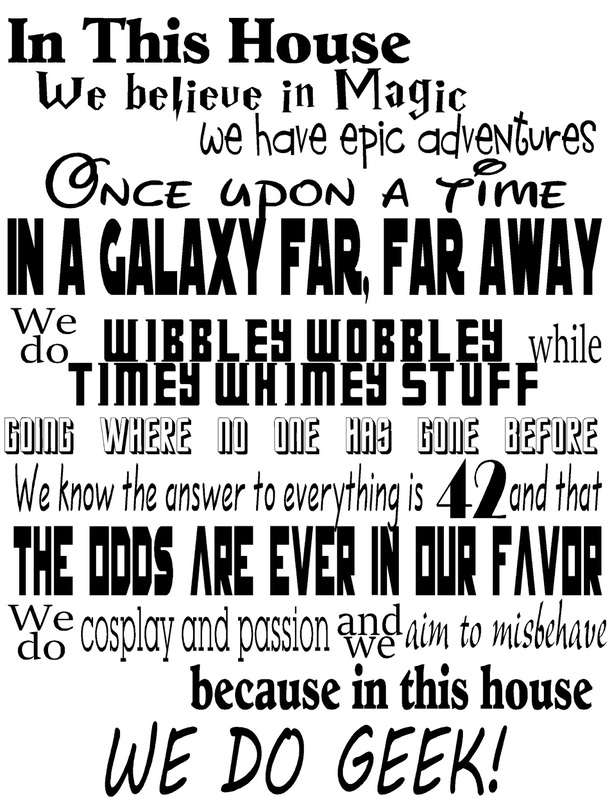 Show your love of all things Geek fandom with this free printable sign. 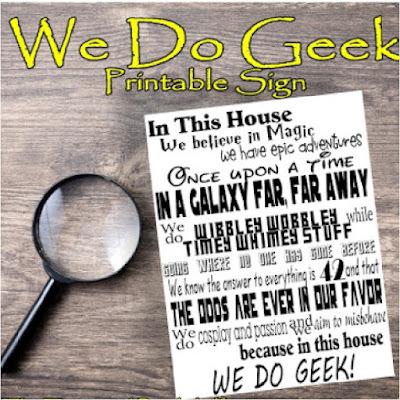 You'll be able to embrace Doctor Who, Harry Potter, Star Wars, Hunger Games, and so much more with this fun printable We Do Geek sign. One of my favorite things about reading is that you can get sucked into a world and have it go on forever. You don't have to leave it behind even if the movie or TV series ends. Most likely, you can find an author willing to continue on the characters and the world in a book. So if you are in love with a Scruffy Nerf Herder, or a Overthinking Alien from Vulcan, or any of the other aliens or fandoms out there, you can keep your love alive indefinitely. So you can carry on the Jedi World, or you can travel with The Doctor, even when you can't watch TV anymore. 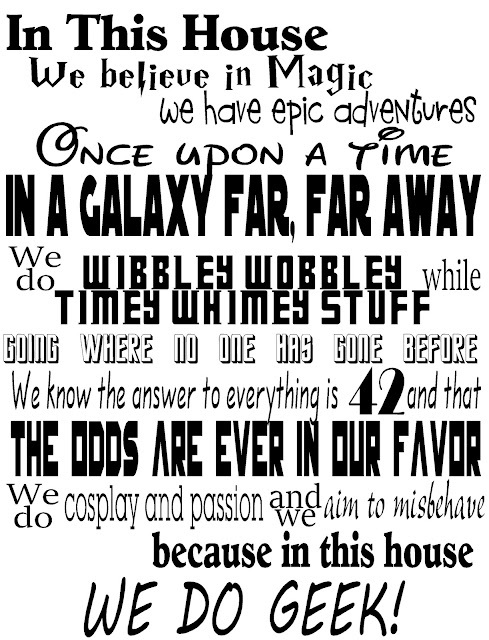 Which is good, because I am Geek to the core and I love my fandoms. So today, I'm sharing a printable sign that will shout your love of all things Geek. 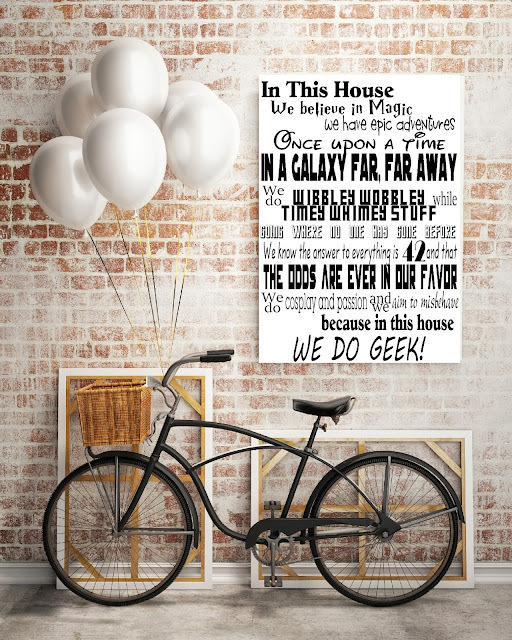 You'll be able to embrace your love of Star Trek, Star Wars, Doctor Who, The Hitchiker's Guide, and so much more with this printable We Do Geek sign. Celebrate all things geek now by right clicking and saving the picture below so you can print it out and show it with pride.